I know one of the main advantages of the suitport is to not need an airlock, hence saving a lot of production costs, launch mass, etc. But why are the EVA suits completely exposed to the environment? Wouldn't that increase the risks on the suits potentially getting damaged? Couldn't the suits be in an unpressurized chamber just to shield them of any environmental dangers/degradation while not in use? You answered that in your question. The basic notion described is often seen on Mars rover style suits as in this image from Wikipedia. The suit itself is the airlock. To go EVA, you climb into the suit from the back, (sort of like an Orlan space suit right now). The difference is that the suit itself seals to the 'airlock' but does not really require the mass/equipment of an airlock. Rather the back of the suit seals to an interface, hopefully simpler than a full airlock and allows entrance/egress to the suit and thence to the outside. Another way of looking at is, a spacesuit needs a airtight seal that can open and close anyway. Why not use that as the outer door of the airlock. So the real question is why not surround that in yet another structure for protection from UV/cosmic radiation/impacts? Probably you would build your suit port in a somewhat sheltered area of your structure as a first draft approach to this. I do not think the real use cases have provided far enough to identify if these are real risks or not to a suit hanging out in space for long periods of time. You have to consider that this is a concept that is still under development. If the suitports will really be used (and I don't see why not, it solves many problems at the same time) on Mars, or anywhere else where dusty environment is a bigger concern than during testing on Earth, they would likely use some sort of a retractable tunnel leading to the ports themselves to additionally protect them from extremely fine-powder airborne dust, corrosive vapors and UV radiation. Tighter solid chambers wouldn't be suitable because of accessibility (there's still quite some maneuvering involved with suitport ingress and egress), additional mass and being difficult to replace, while you can run light and retractable tunnels that would still do the job and can be extended on the spot during first egress. The tunnel cloth doesn't even have to seal perfectly, as long as the material stays somewhat loose on its support structure (not extended all the way). And a more solid structure, if damaged, could bend to block access or even damage rather bulky EVA suits with suitlock. For now though, during testing on Earth, such structures would only impair movement and visual inspection. FWIW retractable tunnels aren't a new concept when it comes to extravehicular suit systems. Here's one NASA's patent from 60's: Extravehicular tunnel suit system, US 3537668 A. This is however a tunnel leading from the vehicle (or any other pressurized environment) to the pressure suit. But it demonstrates that such systems have been in development for a long time. And if we look at the US 4842224 A Suitport patent's citations, it also references US 3537668 A. So there's a good chance that actual Suitport system will use some type of a retractable tunnel also. The "Suitport" images you have seen are conceptual. They serve to illustrate the concept and capture people's imaginations, and showing any additional structure would be counter to that purpose. If we ever move forward seriously with the concept it's entirely likely that some sort of method to protect the suits when not in use will be added. This may be something as light and simple as a removable "garment bag" or retractable tarp covering, a lightweight non-pressurizable porch or vestibule, or all the way up to a heavy pressurizable "garage." So much about a manned Mars mission is still conceptual that it's not worth the effort at this time to do detailed studies of debris threats to external suits and the various means of protecting them. When we get really serious about a crewed Mars mission, then we will nail down debris threat standards and MTBF targets for the suits, compare them against the mission duration and mission implications of losing a single suit, and make an informed decision. My crystal ball says when the time comes (30 years?) we WILL go with the Suitport concept, the suits will be protected by a sort of tarp or sleeping bag, and they will throw in a spare suit just in case. A spare suit should be much lighter than an additional hard protective structure, and protects against multiple contingencies, not just ones brought about by external suit storage. Not the answer you're looking for? Browse other questions tagged spacesuits environment suitport or ask your own question. 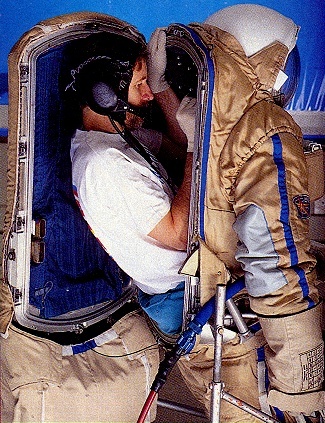 Why is the Sokol spacesuit considered inadequate for EVA? Why use fingers in EVA suits? Why were EVA suits never silver? 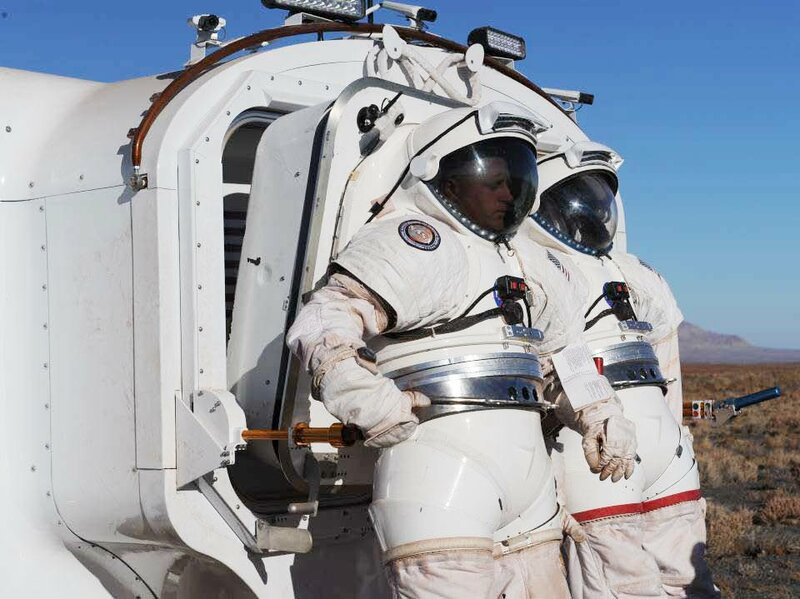 How do space suits offer heat protection i.e. during the lunar day?